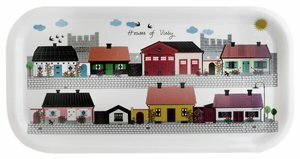 Large tray " Houses of Visby"
Become a member of Gotlands Fornvänner 2019! Mug made of bone china. From the "Houses of Visby" collection. Decorative napkins from the "Houses Of Visby" series. Small tray " Enchanting Picture Stones"